I’m a bit slow in getting round to this month’s Burda, possibly because although there are a lot of nice patterns, I’m not sure they would actually work for me. A lot of people have picked out this pleated orange skirt, which is lovely but a bit shorter than I would want to wear. This lace skirt in the same issue is very similar but would possibly be a better length . I’m not sure I like the styling (or the lace) in the picture but if you look at the line drawings the two skirts are almost identical. The clean and simple shape of this dress appealed to me. I like the way the two pleats at the waist simply balance the wide shoulders. The top of the dress is made out of leather which is interesting but I don’t think very practical or really something I would wear. I also liked the use of a-symetric waist detailing on this pair of shorts and this skirt. I suspect the skirt in particular could be very flattering on someone with a tiny waist. As could my last choice which was this skirt with the pleated hip detail. Did you like any of the patterns in this month’s issue, are you going to make any of them? 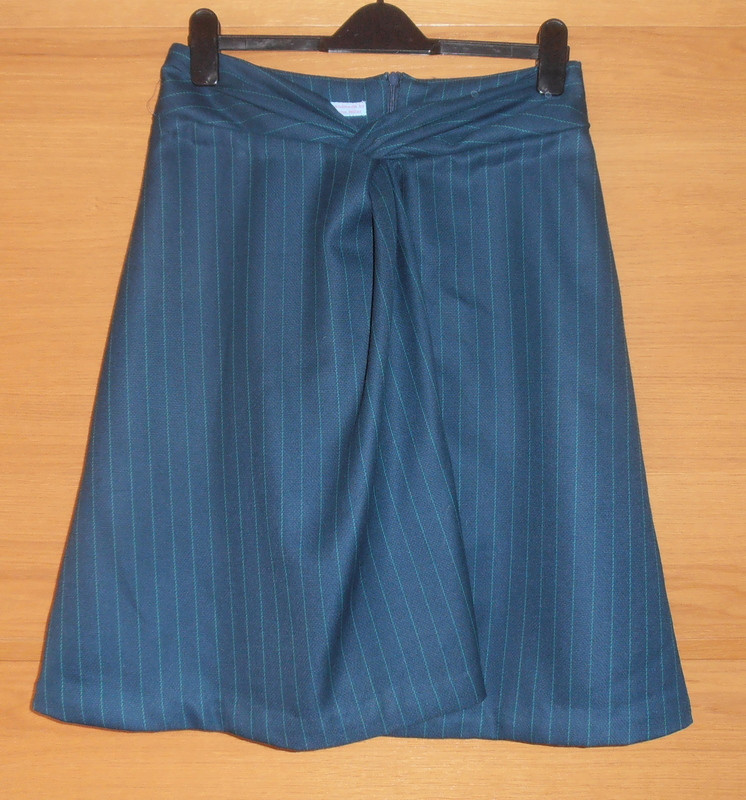 I used a length of teal pin stripped wool suiting and some silk lining bought in Goldhawk Road. The fabric was bought in an ambitious moment when I thought I could make something like a Vivienne Westwood philosophy skirt. Clearly this is way beyond my talent and although the twisty skirt is completely different the idea of using the stripes to accent the folds in the design appealed to me. 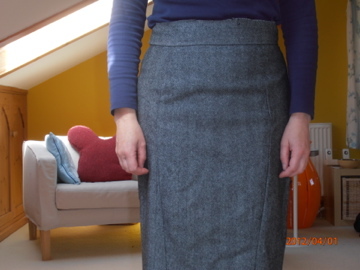 As with the previous skirt the pattern came from March Burda (128-03-2012). Making two of the same design really makes tracing the pattern worthwhile. In order to get the lining to sit correctly within the skirt I basted the tops of the front sections to the lining fabric before making the skirt up. This meant I had quite a lot of hand sewing in order to make all the inner seams neat. This second photo is a pretty accurate representation of the colour. Unfortunately the skirt is looking slightly the worse for wear; I cycled to the cinema last night in it and got caught in a hail storm on the way so it could do with a bit of an iron! I think I’ll wear this skirt a lot. It’s warm and comfortable and quite a bit smarter than a lot of my winter skirts. 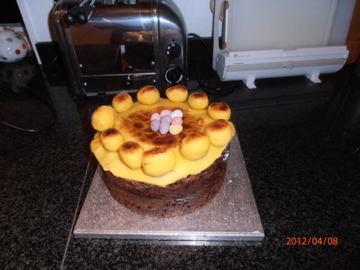 After the success with the Afghans I decided to use the Edmonds recipe and very nice it was too! In a fit of domesticity I decided to make Afghan biscuits this week. Those of you not bought up with a New Zealand Mother or a copy of the Edmonds cookery book may not have had a chance to taste these delicious, crumbly little favourites but I assure you they are the best biscuit on the planet! 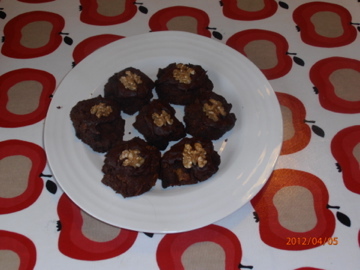 The recipe is very simple; cream together 200g of butter and 75g of sugar, then add 175g of flour, 25g of cocoa powder and 50g of cornflakes. Put spoonfuls on a greased baking tray and bake for 15 minutes at 180C. Take out of the oven and cool, then ice with a glace icing made out of 200g of icing sugar a large tablespoon of cocoa powder and a little bit of hot water. Top with a walnut. You can tell they are good, there were originally a lot more of them! Remember the pencil skirt I blogged about here, here and here? Well I had managed to get a reasonable fit around the sides and back of the skirt but had an unsightly pouch of fabric hanging around my tummy. This seemed to be caused by a couple of pleats which Sheree, kindly, suggested I change into darts. I tried this and it was reasonably succesful but didn’t entirely fix the problem. 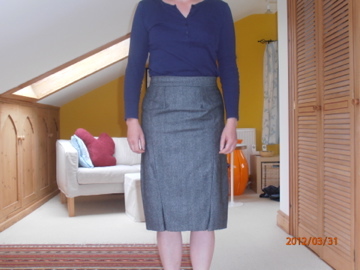 The top of the skirt was much smoother than it was but I was still getting a bit of excess fabric across my belly. So, I took out the zip, removed the waistband and unpicked the seams (again!) and this time removed the darts/pleats and smoothed the excess fabric into the side centre seams. There is still a little bagginess but I am reasonably happy with the result. It’s not perfect but if I had tried the skirt on in a shop I would probably have bought it. I now just need to sort out the lining and I’ll be finished. Does anyone have any tips about how to reinforce the front vents? I have a feeling I will be opening them up every time I wear the skirt if I’m not careful.